The Center for Women's Business Advancement at Southern New Hampshire University tapped, CRDC Loan Officer, Jennifer Boulanger as a guest speaker for their, Women and Money Forum. The business forum drew a crowd of new and seasoned woman led business owners. The forum's theme was "Learn, Earn, Grow!" The Center prides itself on providing future and current women entrepreneurs with the necessary resources to advance their business goals. 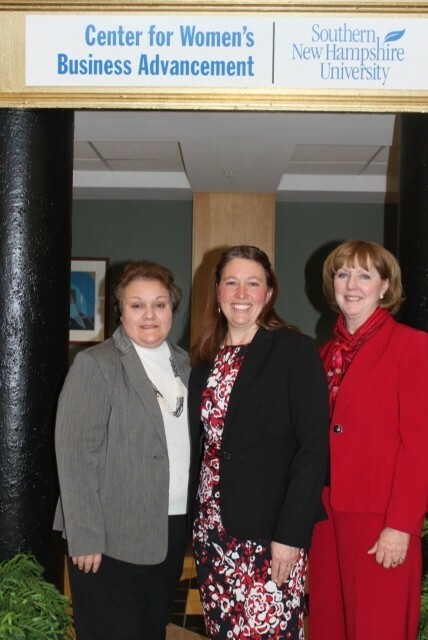 CRDC's Jennifer Boulanger presented with Marilyn Bogue, Lead Economic Development Specialists from the Small Business Adminstration (SBA), and Donna Ehrler, Senior Vice President at Northway Bank. The presentation was focused on Business Finance Options, and packed with information on financing options from traditional bank loans to non-traditional loans through organizations like CRDC which works closely with NH Banks to provide gap financing and SBA 504 loans. PHOTO CAPTION: (L-R), Donna Ehrler, SVP, Northway Bank, Jennifer Boulanger, CRDC Loan Officer, and Marilyn Bogue, Lead Economic Development Specialist, SBA present, "Business Finance Options", at the 2014 Women & Money Forum on Thursday, January 9, 2014.